16 identical units were built by English Electric Co. Ltd., England 1951 to the then British Railways shunting locomotive design modified to broad-gauge. 10 units (Nos310 - 319) were for the Victorian Railways; and 6 units (Nos1 - 6) for the State Electricity Commission of Victoria for shunting at the Yallourn, Morwell and Newport Powerhouse rail sidings. The class was renumbered (Nos201 - 210) to free the 300-319 number series for the S-class diesel-electric locomotives. The SECV units were subsequently absorbed into the VR fleet becoming Nos211 - 216 (ex SECV 3,4,5,6,1,2). Modifications included removal of dual control and conversion to auto coupling. 1953 Builders number 1915 of 1953. F 212 is serviceable and regularly used on works trains, demonstration trains and charter passenger workings. Introduced to replace aging steam fleet units on branch line service, 27 units were built by Clyde Engineering Co. Pty. Ltd. of Sydney. A similar unit was purchased by the VR from the Portland Cement Co., in 1969 and converted from 3'6" to 5'3". ( Nos. 320 - 346 & 413). Several batches of similar locomotives with varying upgraded features increased the fleet to a total of 94 units with an additional 5 "H" class units having an increased axle load and low speed controllers for Melbourne yard hump shunting. The "T" Class units were available for use on all VR lines as well as performing main line duties on both passenger and freight work with a maximum speed of 60 mph. A distinguishing feature of the first series T is the cab being the same height as the hood body, thus they frequently described as 'flat top t's'. 1956 Builders number 102 of 1956. T 333 is currently in use on mainline operations throughout Australia. 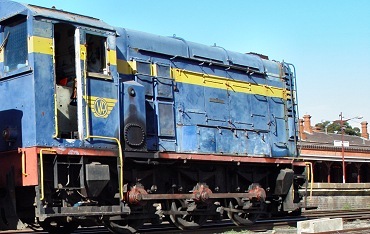 Y 133 is currently on lease to the VGR from Seymour Railway Heritage Centre Inc.
Y Class - Ex Victorian Railway Diesel-Electric Bo-Bo Locomotive. A total of 75 Y Class units were built between 1963 and 1968. These 65 tonne 485 / 559kw units were powered by GM 2 stroke diesel engines, utilising refurbished Melbourne Electric Train bogies. 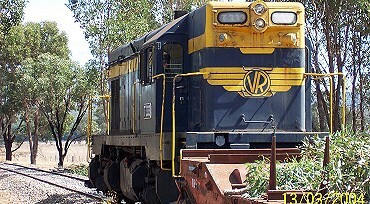 The current unit on the VGR is Y133, on lease from Seymour Railway Heritage Centre. This unit is in VR Blue & Gold.